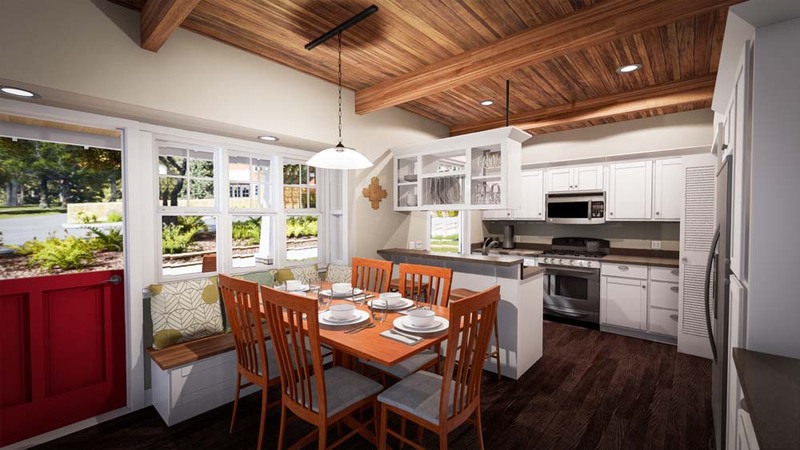 Mirror Lake Highland is the result of a design competition sponsored by the City of Federal Way to showcase cottage housing and sustainable development. 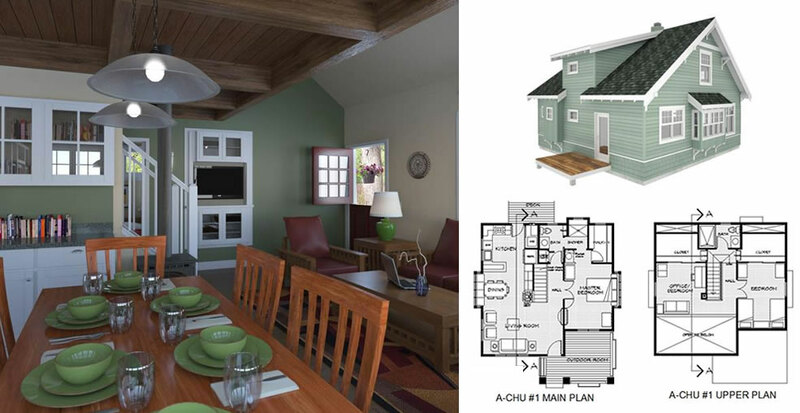 This breakthrough design, by The Nexus Studio, was selected as the very best among the entrants. 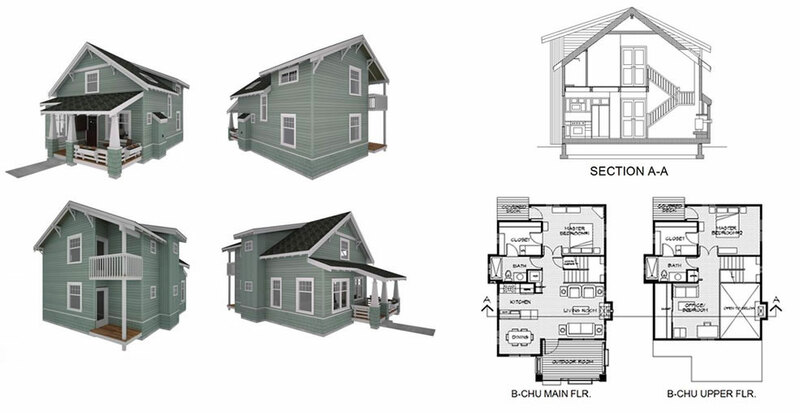 The pervious concrete driveways, rain gardens and common open space integrate seamlessly with large “conversational” front porches and small private yards. Many of the cottages will enjoy views of local landmark Mirror Lake. 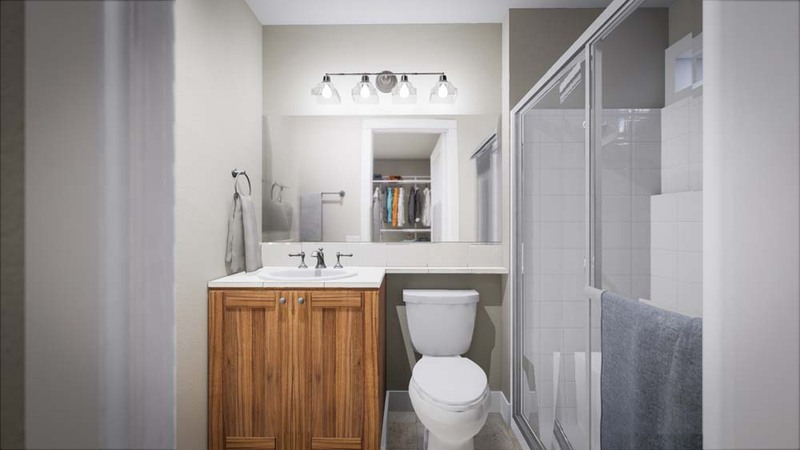 Located just 22 miles south of downtown Seattle and 9 miles north of downtown Tacoma, Mirror Lake Highland is convenient to everything you need. The pocket neighborhood is accessed from a main arterial street with a local bus stop out front. 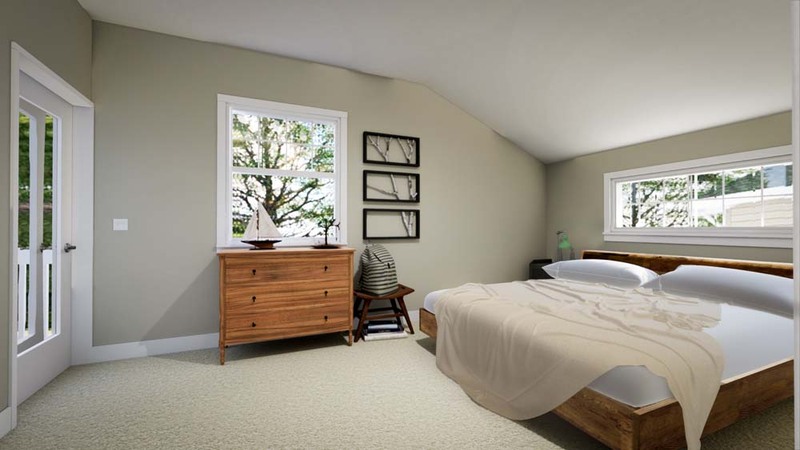 It is 1.5 miles from The Commons Mall and the city center, 2 miles from the regional bus transportation hub, and 2.25 miles from the critical commute route of I-5. There are five Puget Sound public access points within 2 miles of Mirror Lake Highland, including a State Park and a waterfront boardwalk. The community is convenient to both public and private schools and libraries. Several major Puget Sound medical groups have clinics in the immediate area and the full-service St. Francis Hospital is only 2.25 miles away. 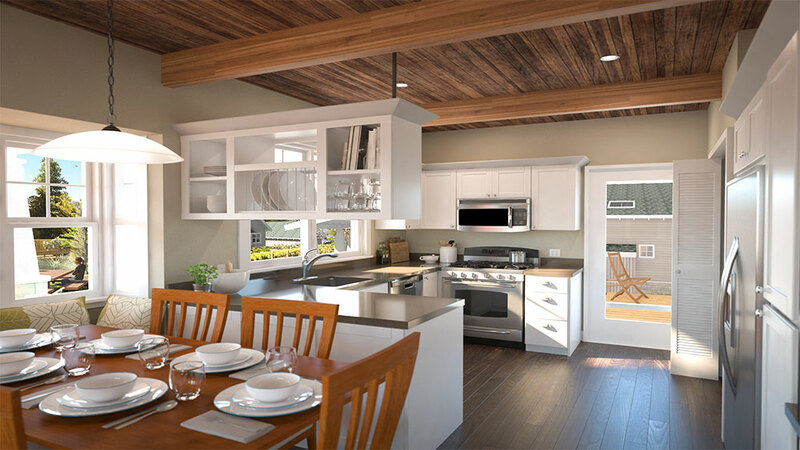 South King and Northern Pierce counties offer many employment and recreational opportunities and Federal Way enjoys easy access to Sea-Tac International Airport and the ports of Seattle and Tacoma. Joint military base Lewis/McChord is a half hour away. 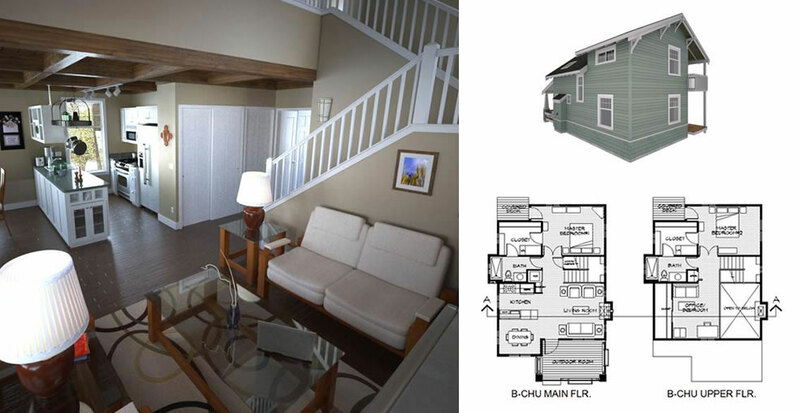 All models feature a “master on main” design to accommodate single level living. The architecture is truly classic. 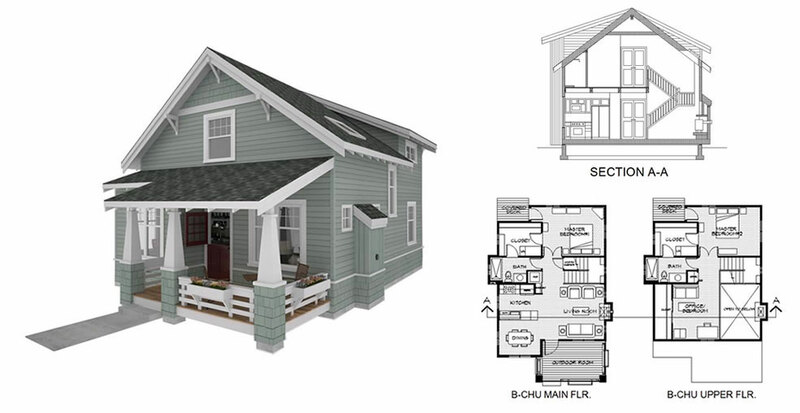 If you ever dreamed of a vintage craftsman bungalow, but with all of today’s conveniences and energy efficient green features, you get the idea. 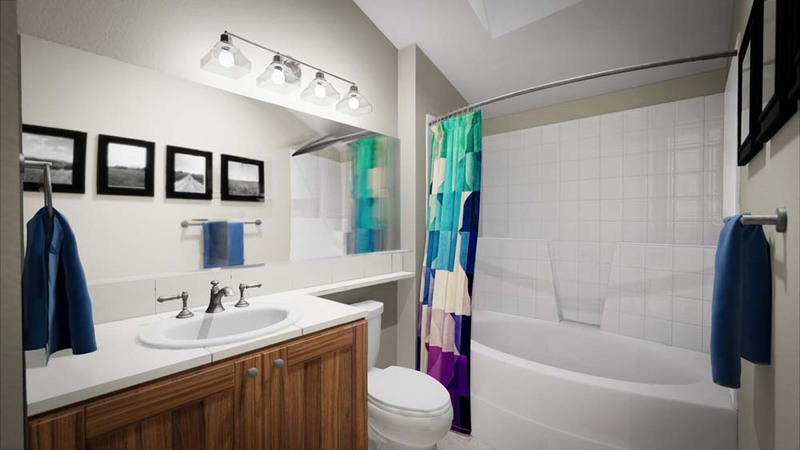 Every space is designed to accommodate more than one use. The great room living/dining/kitchen areas borrow space from each other. Bay window seating enlarges many dining areas. 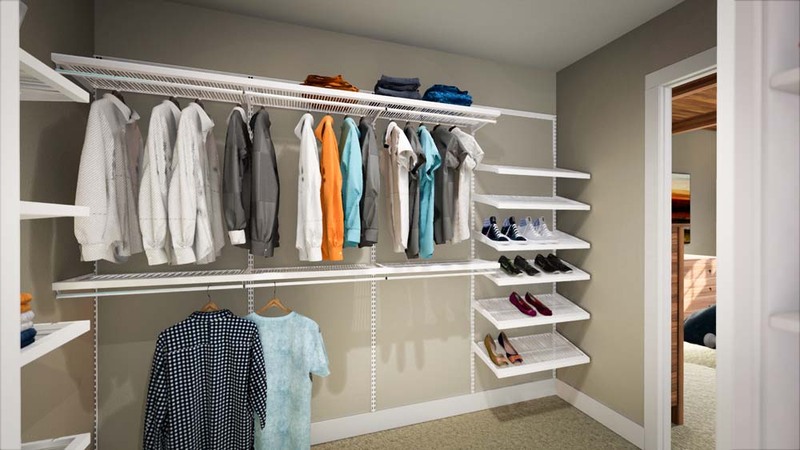 The utility closet borrows working space from the adjacent kitchen when in use. 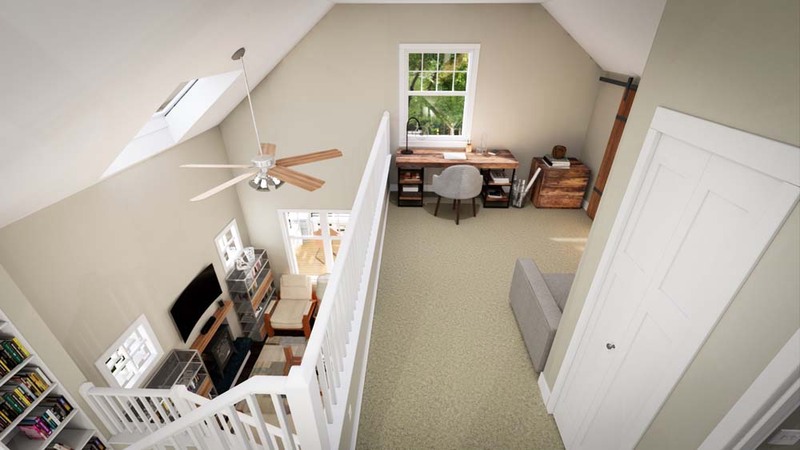 Main floor bedrooms with walk-in closets share media center with living room in many plans. 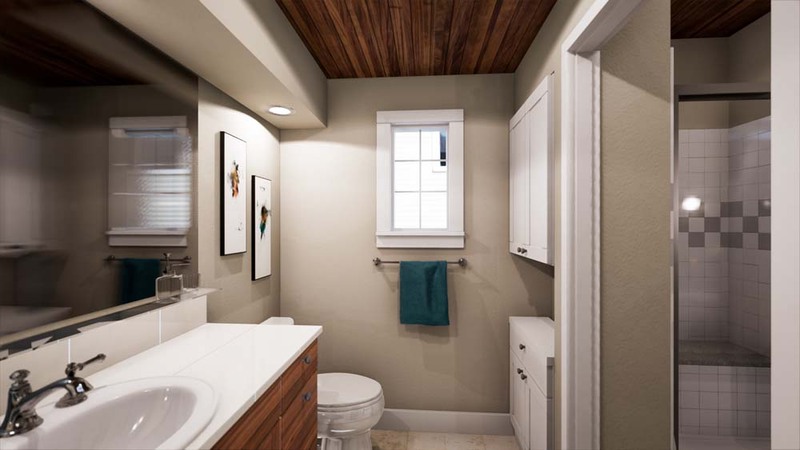 Main floor compartmental bathrooms serve as guest powder rooms as well as the bedrooms full bath. 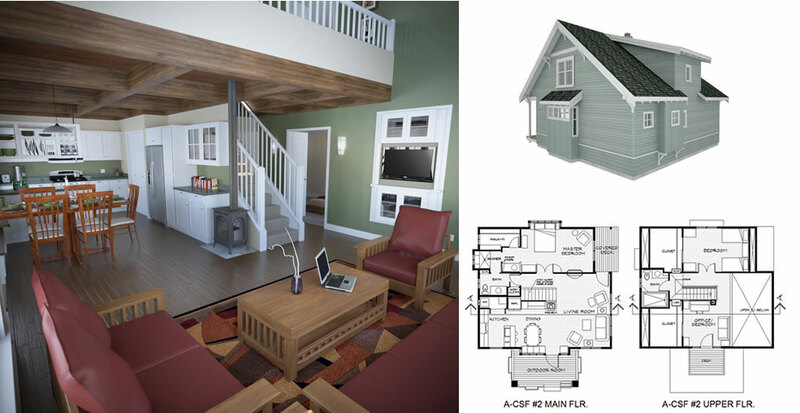 A second floor room can be optioned as an open “loft” office, or a fully enclosed 3rd bedroom. 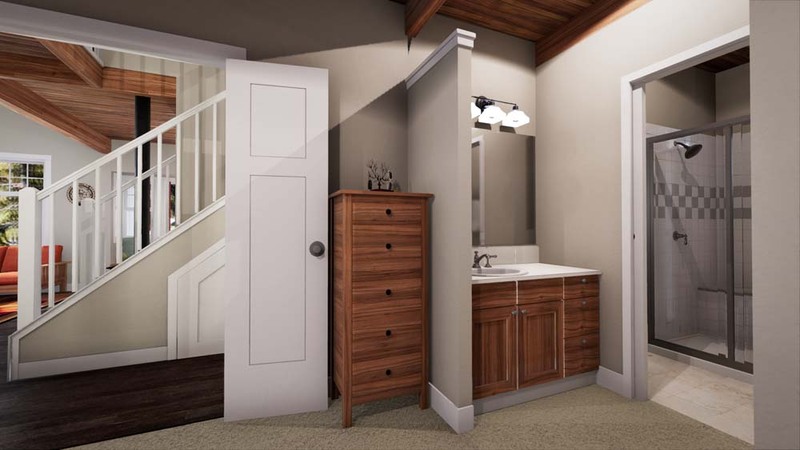 Deep cubby spaces in the bedroom closets and under the stairs provide indoor storage in addition to the garage. The large covered front porches act as outdoor living spaces for most of the year. 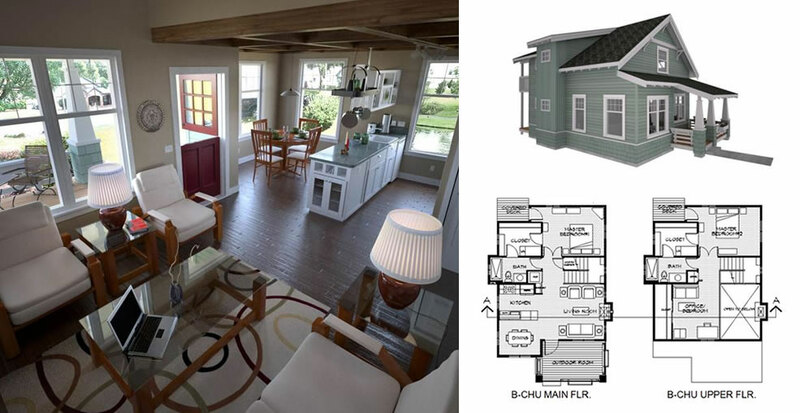 And in true Craftsman style, there are extensive built-in pantries, breakfronts, linen cabinets, display nooks, and custom media centers available. 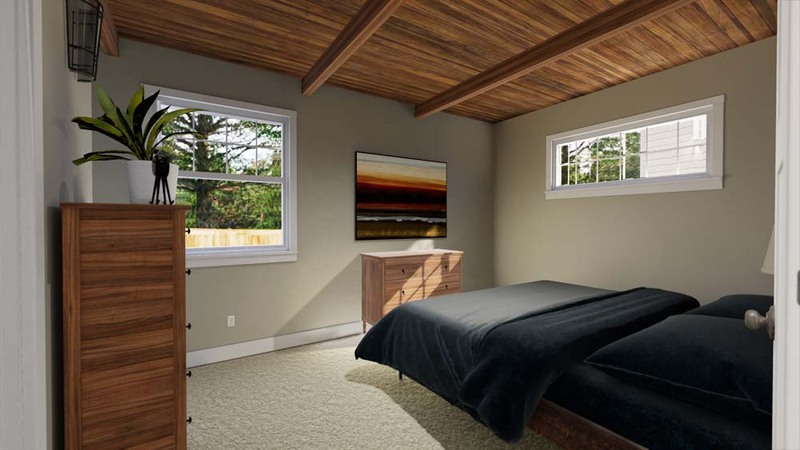 Exact features and floor plan details shown on website may change at any time, and many are optional. Contact developer for the most current information. Conversational front porch with integral flower boxes and “perchable” rail design make this outdoor room an essential element of cottage home living. 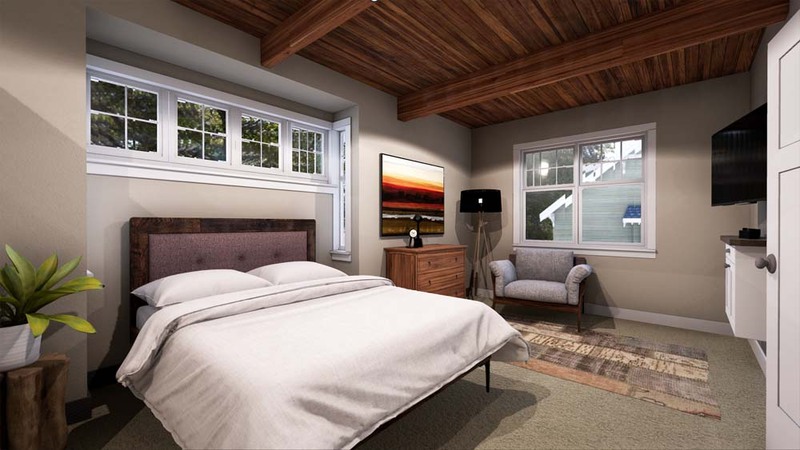 The window and deck arrangement on all four sides is carefully designed to insure privacy between homes while allowing expansive views of the common area and rain gardens. 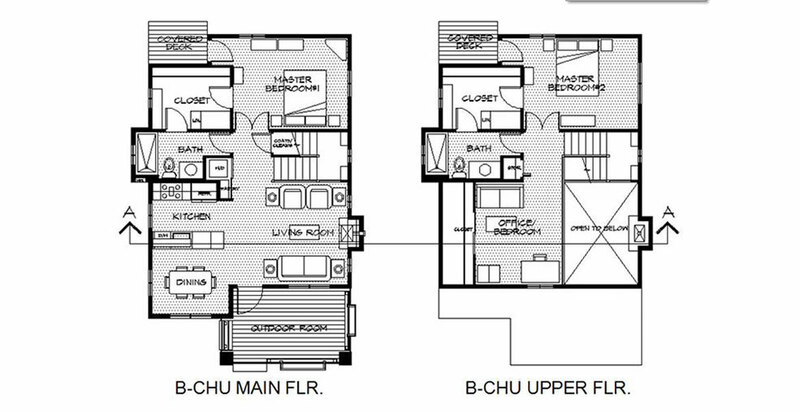 Main floor plan features open great room, utility closet, bedroom with compartmental bath and powder room, built-in pantry, breakfront, window seat, and shared media center. 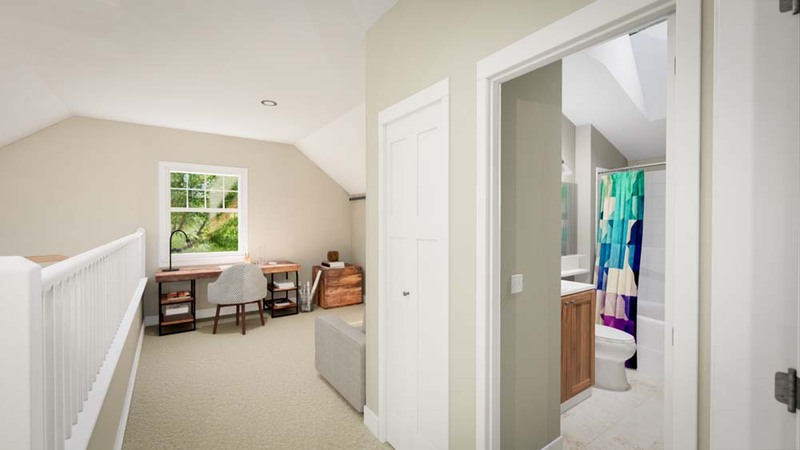 Upper floor plan features bathroom with oversized tub/shower, optional built-in linen and display cabinets, and an enclosed 3rd bedroom w/ deck that can be optioned as an open loft/office/den area. 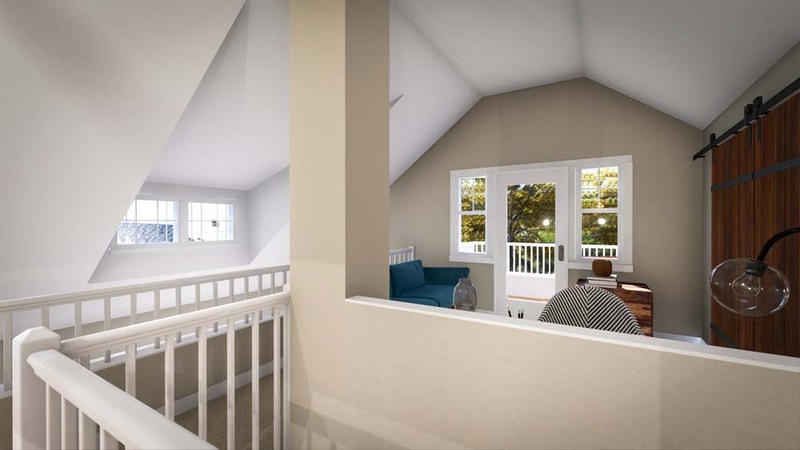 Windows and dutch-door access to all weather front porch promotes indoor/outdoor living. Shoe bench with shoe storage below is located just inside the front door. 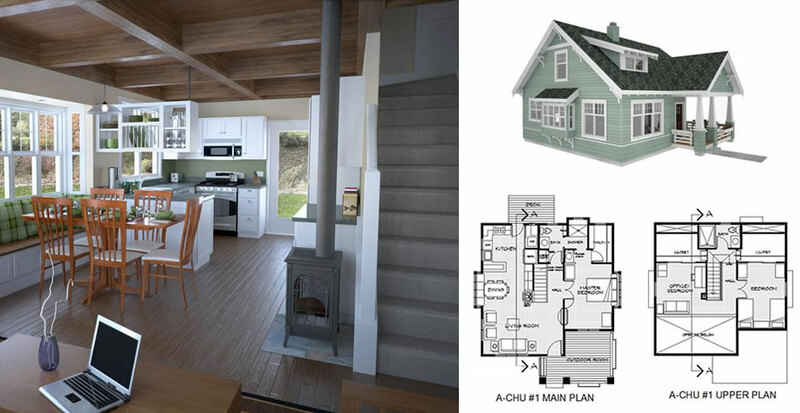 Centrally located gas stove is primary heat source for whole home. 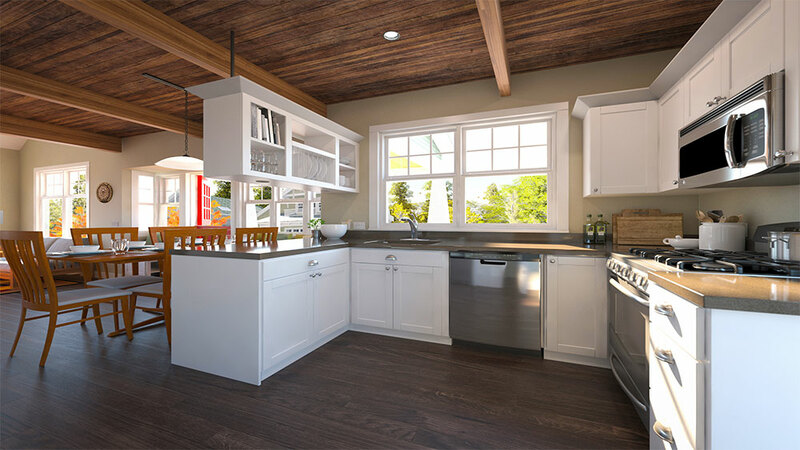 Optional built-in breakfront and pantry cabinets could be replaced with heirloom sideboard, upright piano, or other furniture. 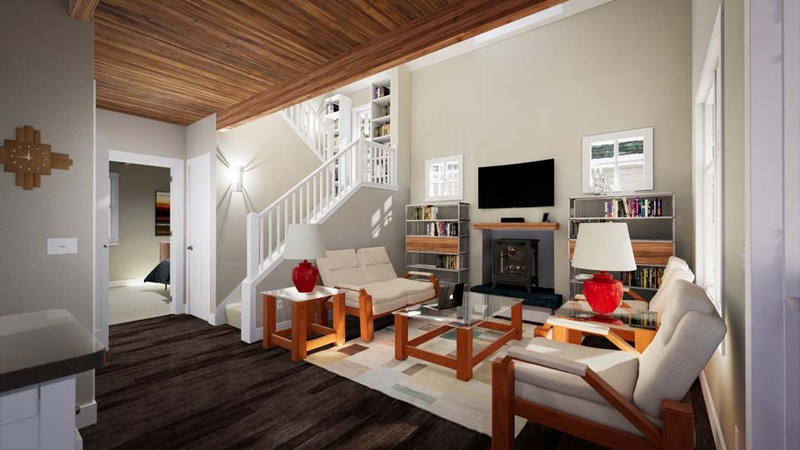 Optional shared media center serves master bedroom also. 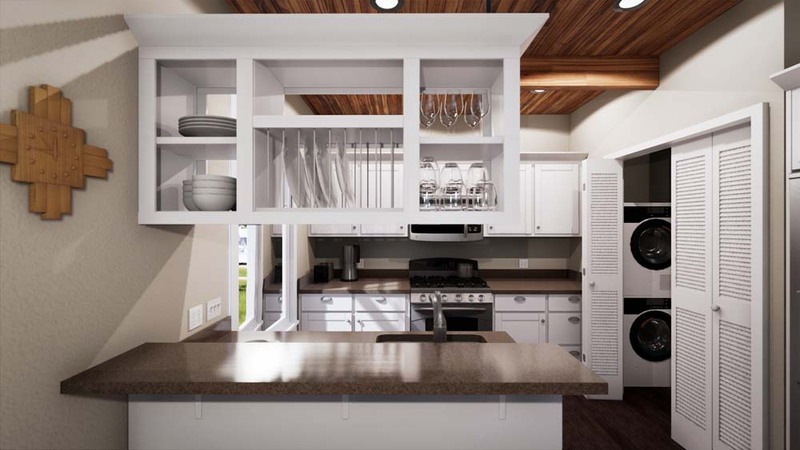 Open custom overhead cabinet provides everyday dish storage with functional two side access while maintaining open view/contact to living/dining area. Conversational front porch with integral flower boxes and “perchable” rail design make this outdoor room an essential advantage of cottage home living. 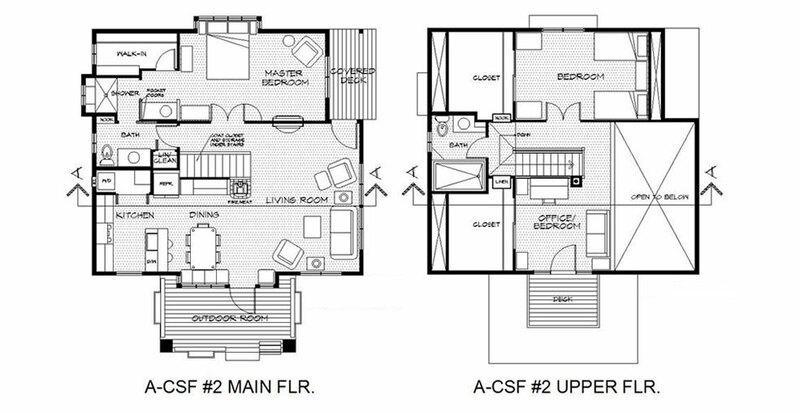 Main floor plan features open great room, utility closet, bedroom with compartmental bath and powder room, built-in pantry, breakfront, window seat, and shared media center. 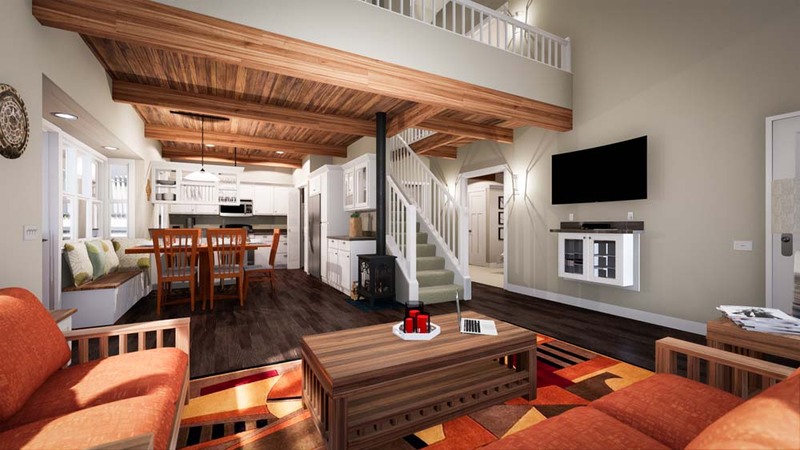 Upper floor plan features bathroom with oversized tub/shower, optional built-in linen and display cabinets, and an enclosed 3rd bedroom that can be optioned as an open loft/office/den area. 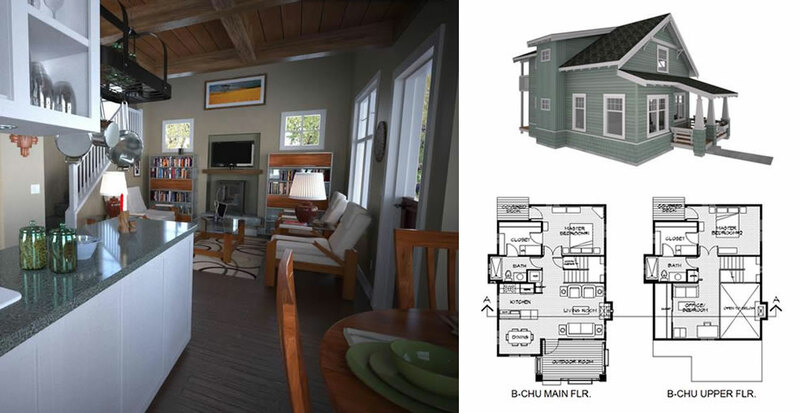 Bay window seating greatly expands the size of dining area. 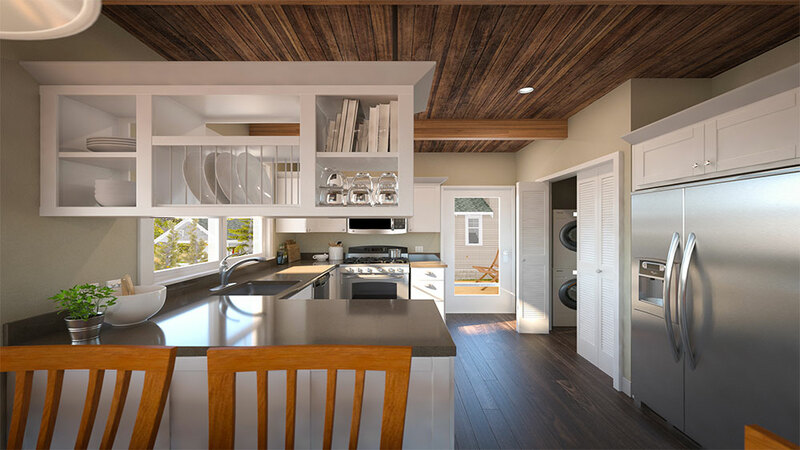 Open overhead peninsula cabinet provides everyday dish storage while maintaining view/contact with kitchen. 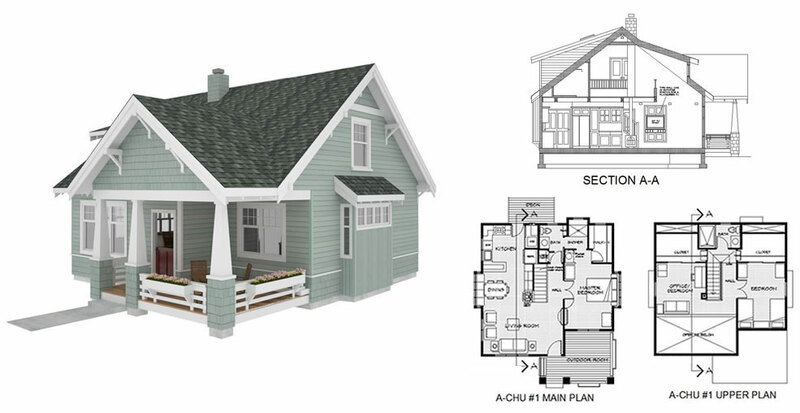 Centrally located gas stove is primary heat source for whole home. 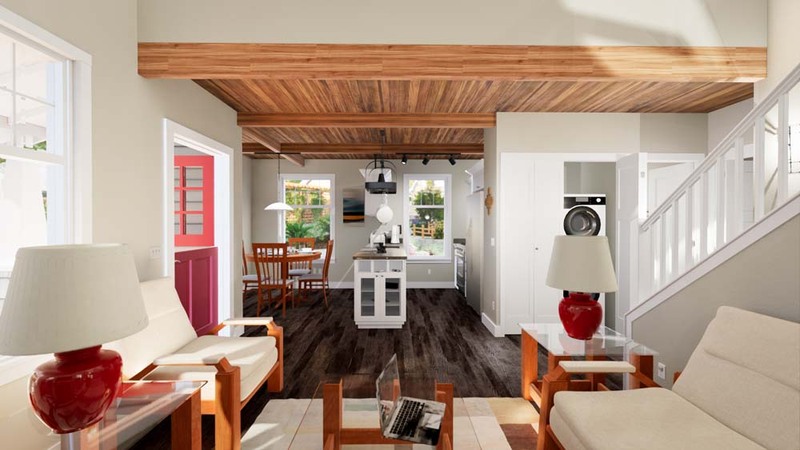 Built-in breakfront and pantry cabinets could be replaced with heirloom sideboard, upright piano, or other furniture. 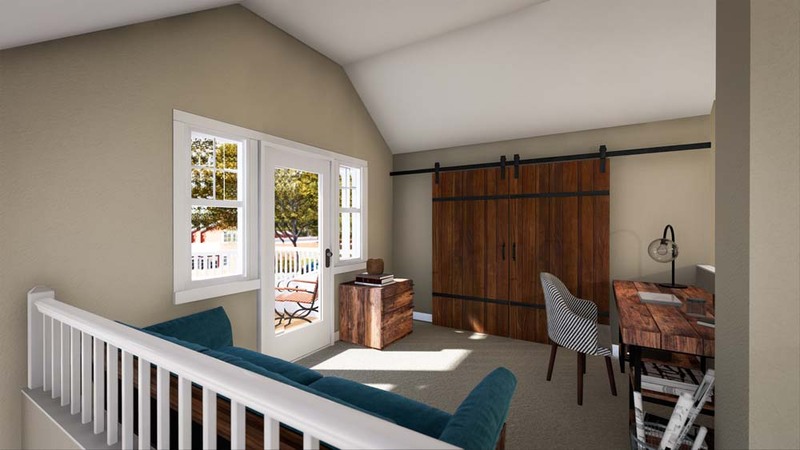 Windows and dutch-door access to all weather front porch promotes indoor/outdoor living. 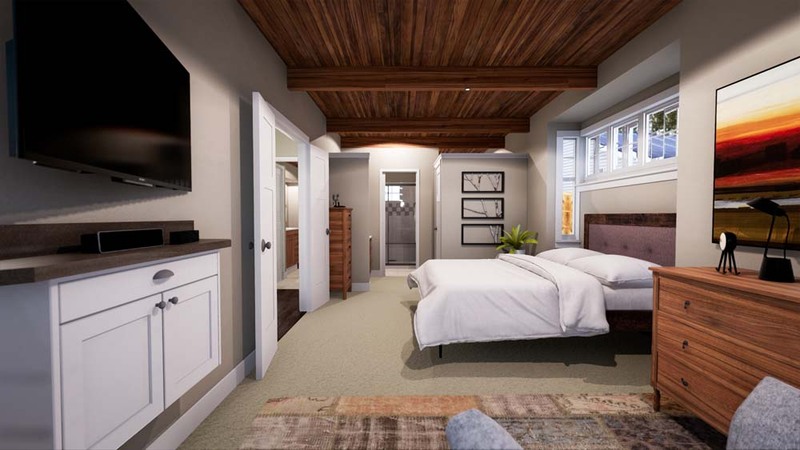 Optional shared media center serves master bedroom also. Conversational front porch with integral flower boxes and “perchable” rail design make this outdoor room an essential attraction of cottage home living. 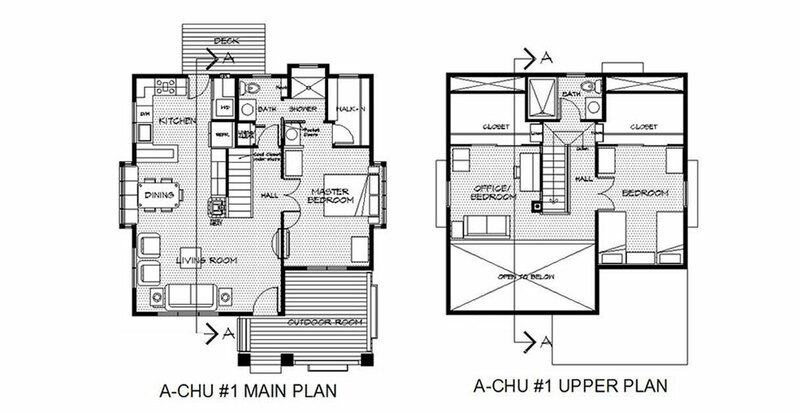 Main floor plan features open great room, utility closet, bedroom with shared full bath and walk-in closet, TV outlets over mantel and on lower wall w/ dedicated media cabinet. 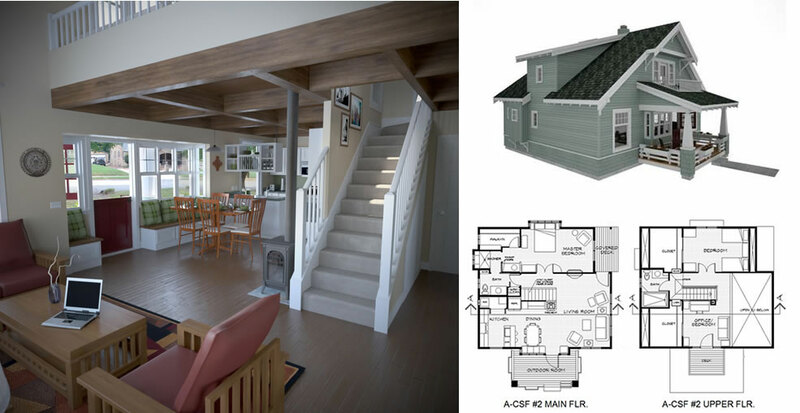 Upper floor plan features bathroom with oversized tub/shower, second bedroom with outside deck, and an enclosed third bedroom that can be optioned as an open loft/office/den area. 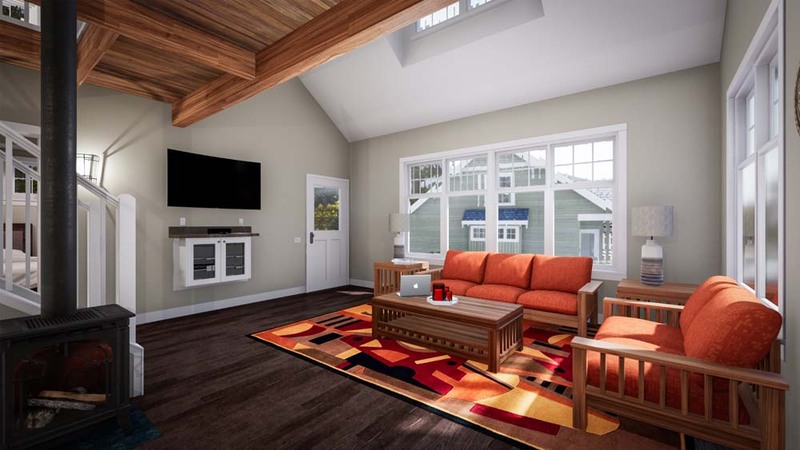 Windows and dutch-door access to all weather front porch promotes indoor/outdoor living. Media hardware cabinet with mail slots above. 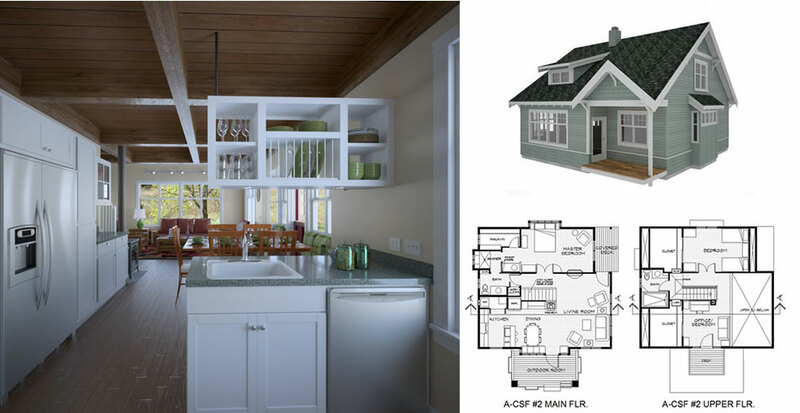 Efficient “Pullman” kitchen has functional two side access to open overhead dish and pot rack for everyday use. Stacked washer/dryer is behind sliding closet door right of kitchen. 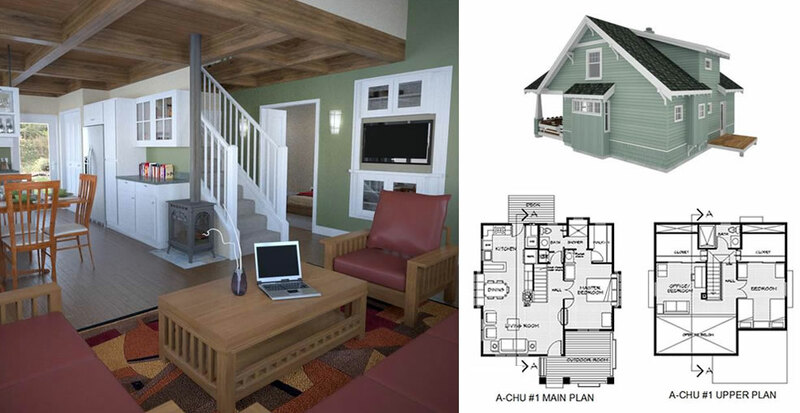 The gas stove and media wall is visible from all rooms. Television can also be floor mounted. 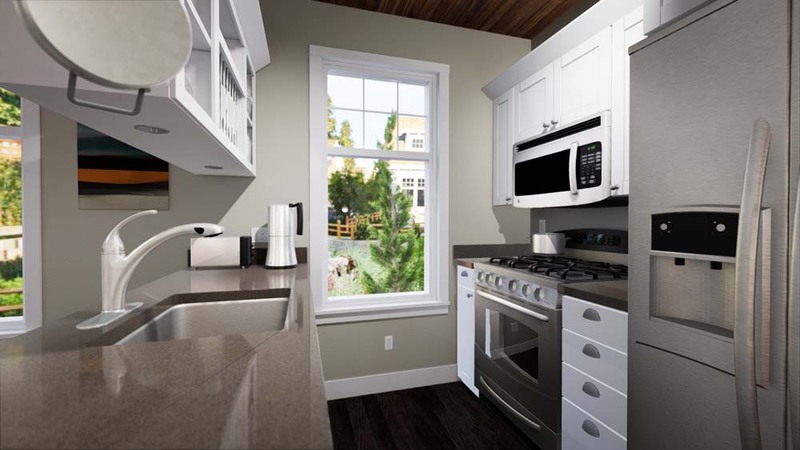 Gas stove is the primary heat source for whole home. 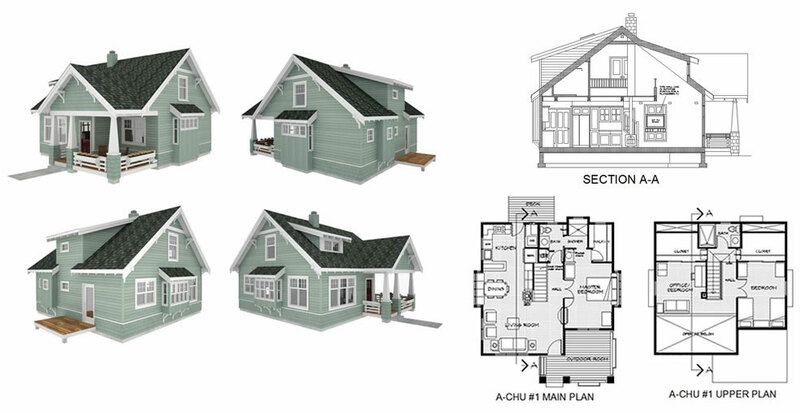 What makes more sense than designing a land plan that keeps on giving? 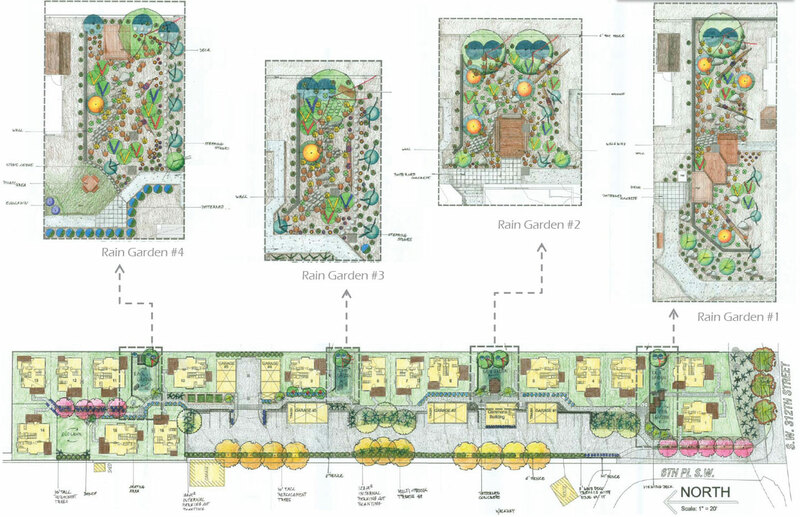 Gives back to the residents with a secure environment for viewing, walking or sitting, gives back to the earth the rainfall that naturally infiltrated before development, provides fruit for those who want to pick it and vegetable gardens for those who want to grow them. 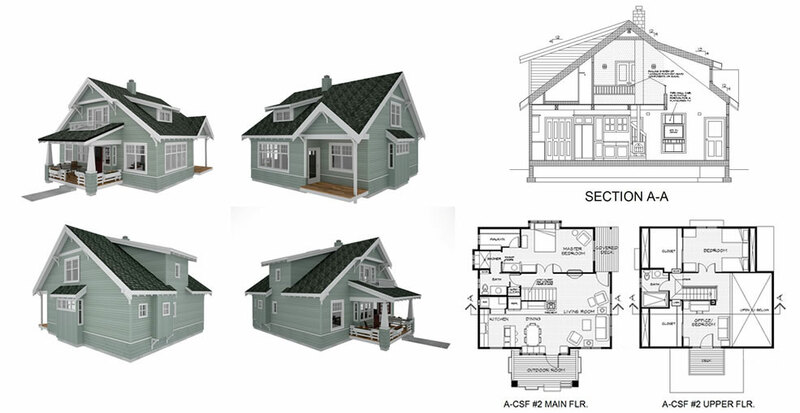 In addition to being showcases of cottage housing, our projects and land development approaches are paradigms for “green” development. 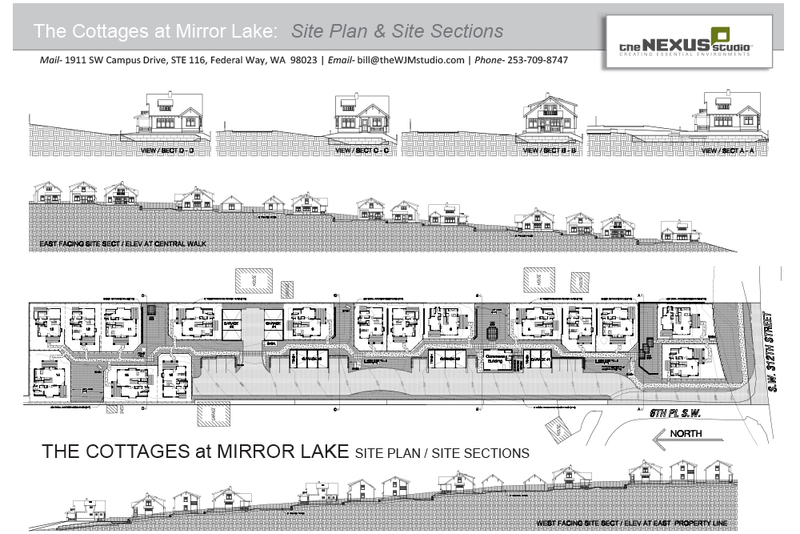 Please see the Approach Tab for more information on the Low Impact Design techniques employed in the design of the Mirror Lake Highland site plan. 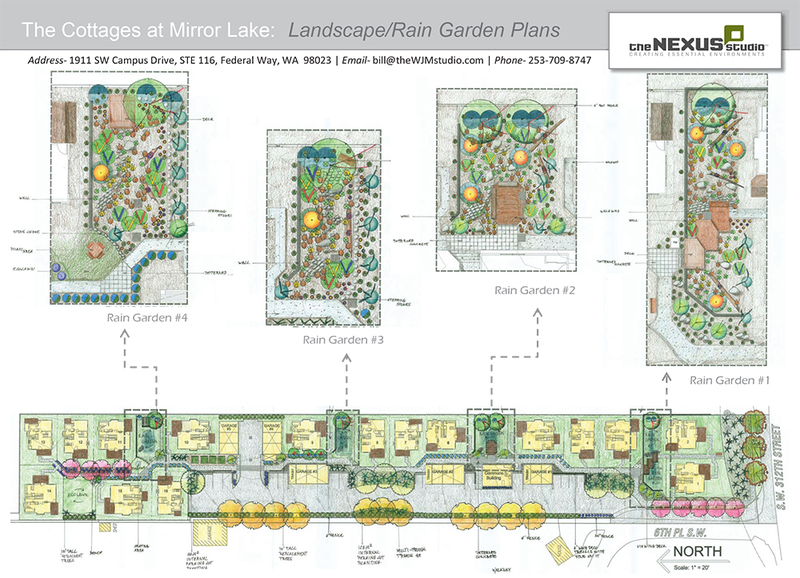 See Site Plan/sections, project data, and landscape plan. 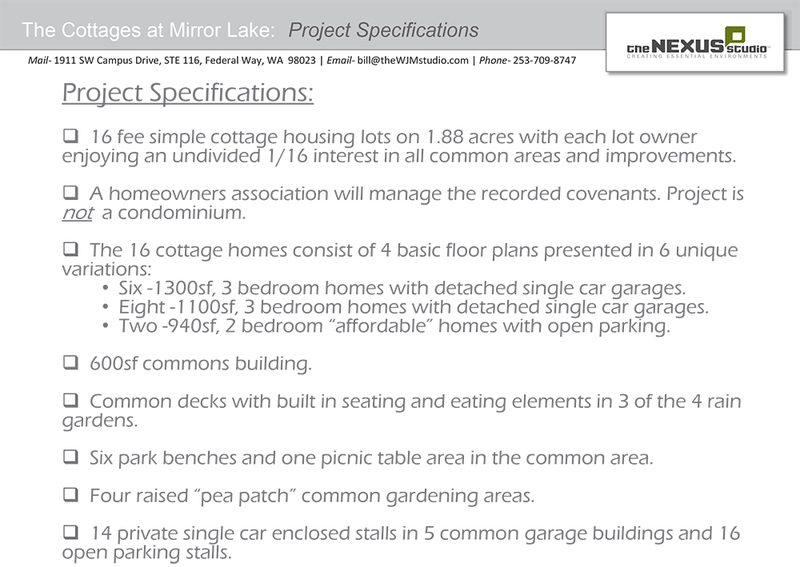 The Cottages at Mirror Lake is not a condominium. 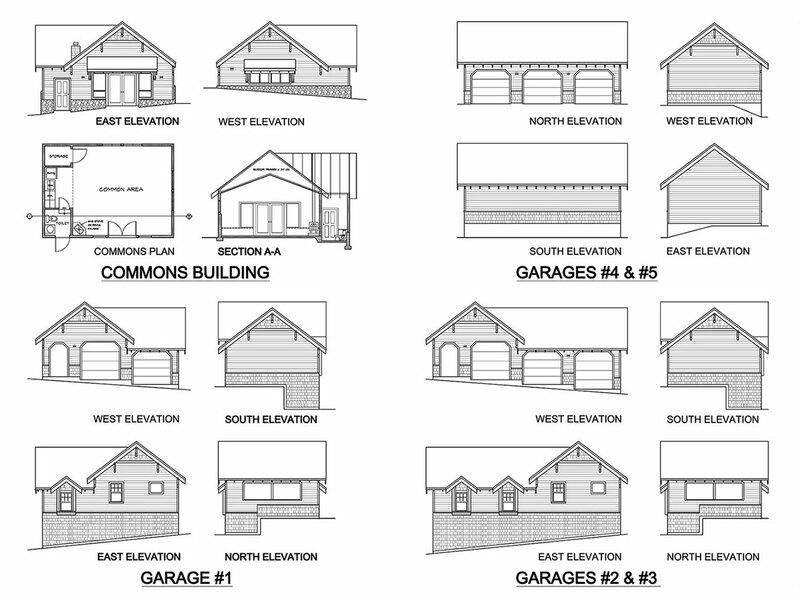 You own your home and lot as well as a 1/16 interest in all of the common area and buildings - 5 freestanding garages and 1 community building. This common property is maintained by a Homeowners Association (HOA) controlled by the residents. 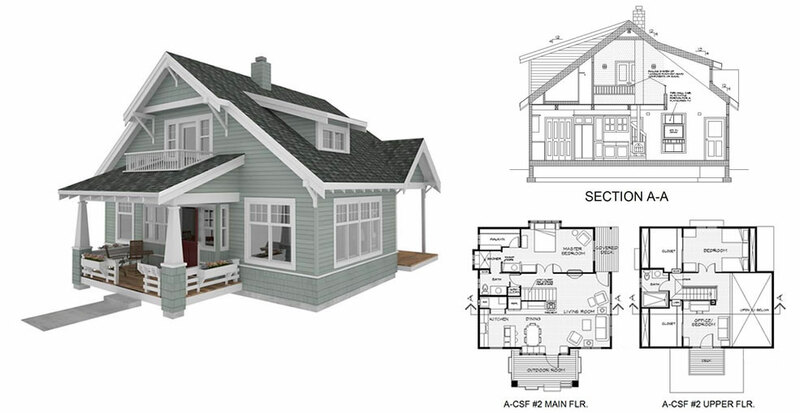 Maintenance of individual homes is the responsibility of the homeowner subject to HOA Protective Covenants.